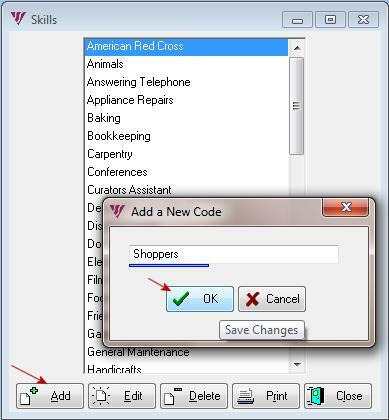 To match a volunteer skill to a requested skill by a Job/Client, e.g., volunteer shoppers with clients requesting shoppers, use the Skills feature. This is easy but may require some setup if you have not used Skills before. You can select up to 3 skills in Jobs/Clients and an unlimited number of skills for volunteers. 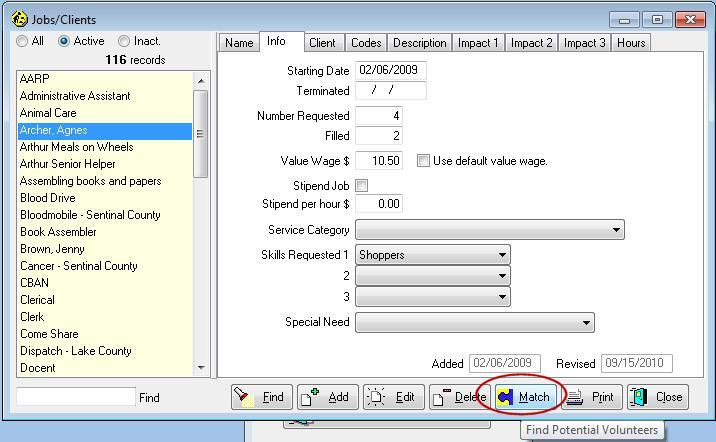 Then use the Match button in either section to identify volunteers who have the same skill(s) as those requested by jobs. Both sections share the same skills list, to which you can add new skills. In the Jobs/Clients section which skills (up to three) does this job require of its volunteers? These are from the same skills bank that is used when noting all skills that a volunteer possesses or is interested in doing. The Volunteer Reporter uses this information to help you try to match qualified volunteers with jobs requesting specific skills. Here we tell the Volunteer Reporter which skills a job needs, while in the Match section we prepare the matchup between volunteers and jobs. In the Jobs/Clients section on the Info tab, choose the Skills Requested. Click Edit | Click on Skills Requested 1 | Select a skill on the list. Repeat if the Job/Client requests more skills. Jobs/Clients Volunteer section | Info tab| Edit | Skills Requested 1 | Highlight a Skill | OK. 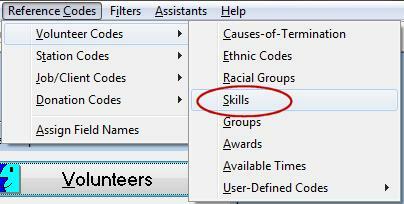 In the Volunteer section on the Skills/Groups tab, select This Person's Skills. Click Edit | Highlight an Available Skill | Click Add One. 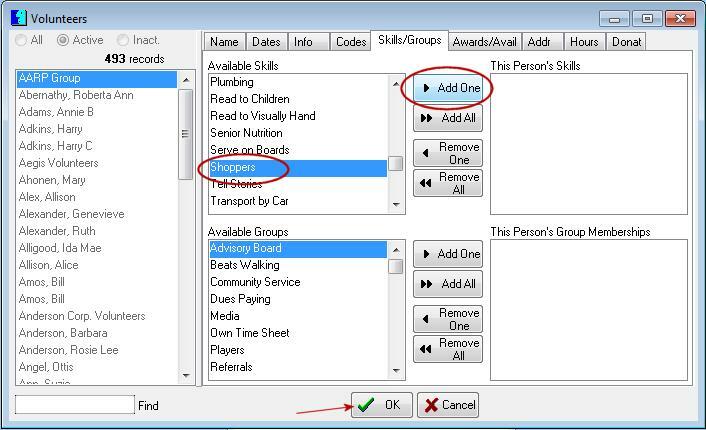 In order to see the new Skills value and add it to a volunteer's record you will have to close and reopen Volunteers if it was open when you added the value. 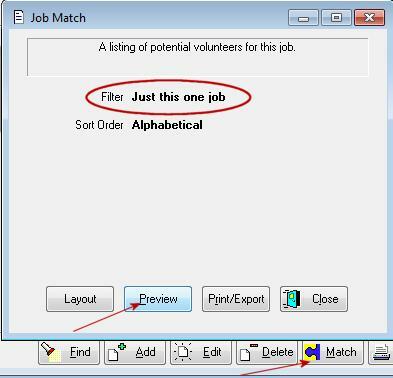 In earlier versions, click the Match button on the Volunteers screen to prepare a report listing all possible volunteers for this job based upon the volunteer's skills. In version 6.0 and greater, click the Print button on the Volunteers Profile screen and choose the Volunteer Match report. In this way the Reporter uses this skills bank information to help you try to match qualified volunteers with jobs requesting specific skills or schedules. 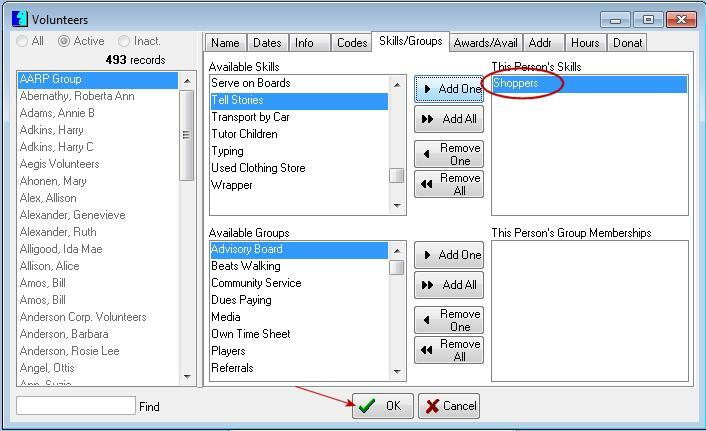 If your desired skill is not on the list, you will add the skill to the skills list in Reference Codes. We have a Skills Report which should work for you. It gives the skill name, the volunteer's name, phone numbers and email address. 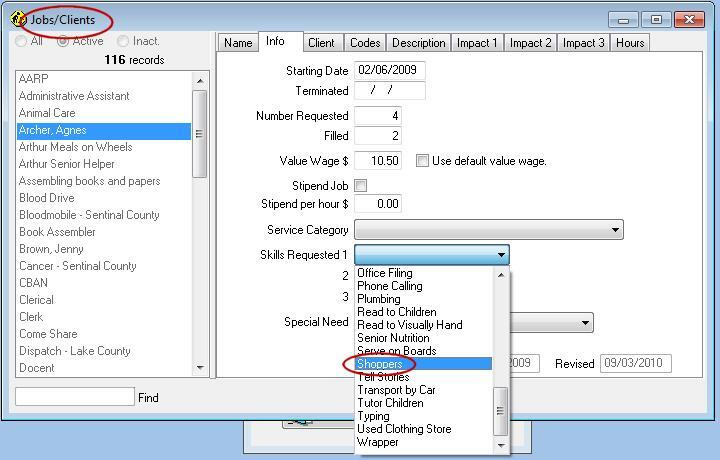 You can run the report as-is and fast forward to the skills of interest, or make a filter on specific skills. To make a filter on a particular skill, open Filters in the top menu bar. Select the skill(s) you want by clicking on a skill to get a >> beside it. 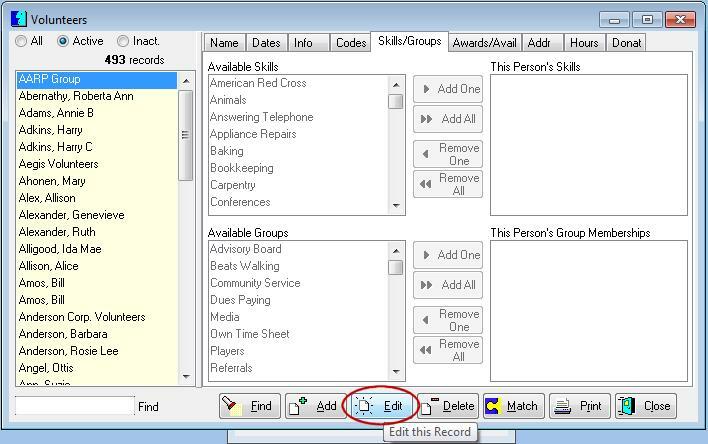 To run the Volunteer Skills report for only those skills, select the new filter.